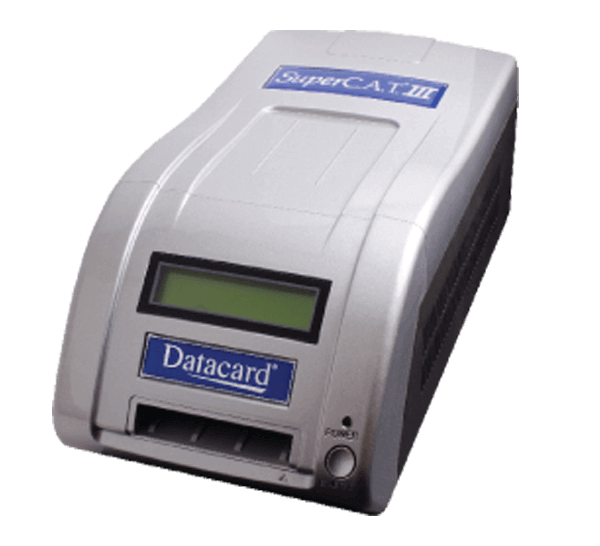 Dramatically improve customer service levels, reduce costs and gain a competitive advantage with the Datacard® SuperC.A.T.® III encoder. Together with Datacard® CardWizard® instant issuance software, this compact, fast and secure magnetic strip encoder allows financial institutions and retailers to offer PIN change and re-PIN services in-branch — allowing consumers to immediately update their PIN and leave the branch with an updated card that can be used immediately. The SuperC.A.T. III is compatible with flat printed or pre-embossed debit, credit or ATM cards, which creates an efficient and affordable way to attract and retain cardholders. In the future, upgrade your software to also support chip PIN updates on contact or contactless smart cards using the SuperC.A.T. III encoder. Easy re-PIN. The SuperC.A.T. III encoder makes it easy to re-PIN cards at any time. Cards are quickly re-encoded and customers leave with their updated card ready for immediate use. Lowers costs. Personal mailing of cards or PIN mailers when customers forget their PIN or a card gets lost, stolen or blocked is virtually eliminated. The SuperC.A.T. III encoder also saves issuers significant infrastructure investment, while enhancing cardholder satisfaction and ultimately increasing card usage. Compact, user-friendly system with easy-to-read lighted LCD display. Inherent security features from motorized encoding that eliminate the risk of “card skimming”. Proper card positioning for reading and encoding that eliminate swipe-based device errors.